Aminosilane grafted and 1,4-phenylene diamine modified reactive montmorillonite was exploited for the generation of aromatic polyamide-layered silicate nanocomposites. For better compatibility between the two disparate phases, the hydrophilic nature of montmorillonite was changed into organophilic by ion-exchange method using 1,4-phenylenediamine as an intercalating agent and the hydroxyl groups present on clay surface and edges were used to graft 3-aminopropyltriethoxysilane (APTS) on clay platelets. 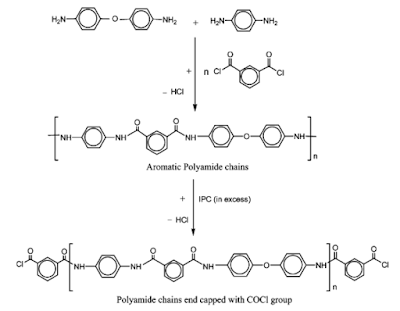 The dispersion behavior of reactive organoclay was monitored in the polyamide matrix prepared from a pair of diamines (1,4-phenylenediamine and 4-4′-oxydianiline) with isophthaloyl chloride under anhydrous conditions. The resulting chains were selectively converted into carbonyl chloride ends to interact exclusively with free amine groups of the 1,4-phenylenediamine and APTS grafted on nanoclay. Thin composite films containing 2 to 10-wt. % clay were probed for FTIR, XRD, SEM, TEM, tensile testing, TGA and DSC measurements. XRD and TEM results described ample dispersion and morphology of clay sheets in the nanocomposites. Mechanical measurements revealed that tensile strength increased 110 %, elongation 172 % while modulus and toughness augmented many folds upon the addition of 4-6 wt. % clay in the matrix. Thermal decomposition temperatures of the nanocomposites were in the range 425-480 oC. The glass transition temperature increased up to 142.4 oC with 6-wt. % addition of organoclay in the matrix relative to pure polyamide depicting interfacial interactions among the phases.